Welcome to our twenty-eighth Tumblr Tuesday, where every Tuesday we celebrate our love of Tumblr by interviewing the mastermind behind a new blog. Tumblr, a New York City based startup, is like the FFFFound for the rest of the world. It’s as shareable and fast-paced as Twitter but populated with more inspiring text and rich images. While I work in the tech industry and am surrounded by handsome, brilliant geeks all day long, I somehow always find myself dating Ad Men! (Yet, I still don’t know how to use Photoshop.) 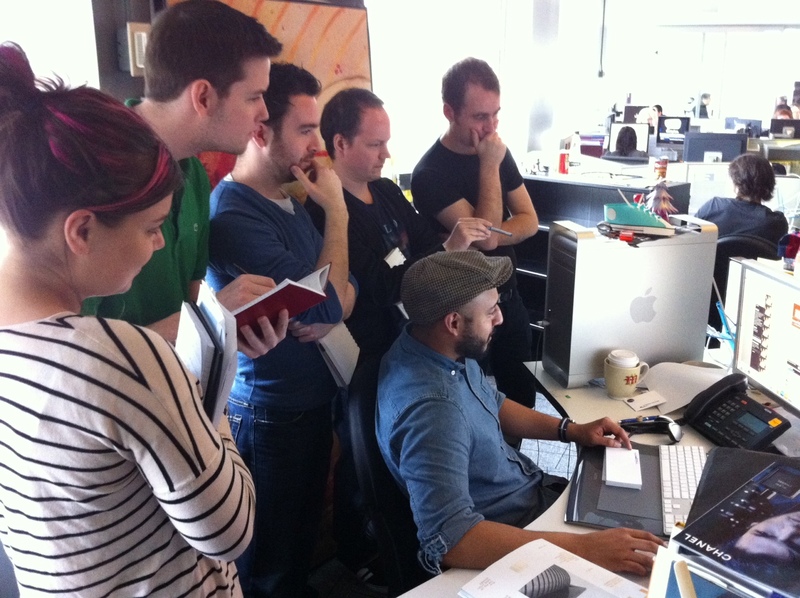 So when I stumbled upon the Tumblr, Hovering Art Directors, I LoLed. It’s so true. Art Directors love to hover; especially in skinny jeans and buttoned shirts from Steven Alan or beanies and long sleeves. They can be found looking over your shoulder, holding a latte and watching as you pump your creative juices. I wonder if it helps Art Directors think or prevents them from falling asleep. For this week’s TT, we reached out to Jacqueline Law, an Art Director/Designer at Bartle Bogle Hegarty and the creator of Hovering Art Directors. CBM: Who is the evil genius behind Hovering Art Directors? Jacqueline Law: The chopstick wielding, lone ranger @waleikcaj. CBM: What inspired you to make this Tumblr? JL: For anthropological reasons and an ounce of vengeance. CBM: How many total posts do you have? And how many people follow your blog? CBM: Why do you think Art Directors notoriously hover? JL: I’ve heard, “Those who can’t design, hover.” I kid. I think Art Directors are more prone to aggressive hovering because they need be reassured everything looks as good as they can be. CBM: How does it make you feel when people hover over you? JL: It’s like the feeling you get when you’re a kid, instructed to go up to the black board, in front of all your peers, to solve a complicated math equation. You can feel all their beady eyes on your back; watching your every minuscule move, cough at every mistake. You start to sweat profusely for no reason. Now, of course, I’m a seasoned pro, with the occasional sweats. CBM: How long does it take you to notice now when you’re hovering over other people? JL: Before the Tumblr took off, people weren’t as aware of their hovering as they are now. But I think once your nose is pressed against the screen, it’s time to back off. CBM: Who hovers more- boys or girls? JL: Boys. Wonder what Freud might think of that? CBM: Which city hovers the most in the U.S.? CBM: Do people from other countries hover? JL: Definitely, after NYC, London comes close second then Rio de Janerio.